Jeffrey Halpern, an assistant professor of chemical engineering at UNH, is working to address a prevalent mental health challenge: major depressive disorder (MDD), which frequently goes unrecognized and undiagnosed in the 16.1 million Americans who suffer from it. But the path from the lab to the doctor’s office can be a long one, especially for researchers working in higher education. That’s why Halpern, along with four other distinguished junior investigators, will be receiving support through UNH’s new Center of Integrated Biomedical and Bioengineering Research (CIBBR). The center, which is funded by a ﬁve-year, $10 million Center of Biomedical Research Excellence (COBRE) grant from the National Institutes of Health (NIH), will accelerate the translation of their basic biomedical and bioengineering research into actual innovative tools and treatments that improve human health. Halpern and his team are developing the ﬁrst point-of-care diagnostic sensor that can accurately detect the chemical proﬁle of diseases in patients’ drawn blood. His goal is to produce a low-cost, high-throughput tool that can diagnose MDD in the doctor’s office, leading to swifter treatment and better patient outcomes. The technology may one day be used to diagnose other psychiatric diseases, neurological diseases and cancers. While Halpern is designing his sensors to function outside the body, fellow junior investigator and assistant professor of electrical and computer engineering Edward Song is developing sensors to help clinical researchers monitor the behavior of multiple neurotransmitters inside the brain. The information gained from Song’s sensor will help unravel the complex root causes of neurological diseases and disorders such as Alzheimer’s and Parkinson’s, paving the way for earlier diagnosis and new clinical approaches. Unlocking brain functions at the molecular level is also the goal of Xuanmao Chen’s research. Chen, an assistant professor of neurobiology, has discovered an enzyme that, when it undergoes a speciﬁc mutation, causes both obesity and depression. As a part of the CIBBR, he is working to determine the cause of the mutation and develop therapeutic interventions that prevent it from happening. While an understanding of brain chemistry will solve many human health issues, Sergey Charntikov says there’s a pressing crisis — addiction — that requires a different tack. The assistant professor of psychology is investigating the role environmental stimuli play among smokers, and he believes this new approach, which doesn’t focus on nicotine’s addictive chemical properties, will lead to more effective individualized treatments and better long-term outcomes. Among recent medical innovations, biofabrication offers some of the most exciting human health impacts. Advances in tissue regeneration mean that, someday, waiting lists for donated organs and artiﬁcial bones made from metal alloys will be relegated to the annals of medical history. At the CIBBR, Kyung Jae Jeong is working to hasten the arrival of that day. Jeong, an assistant professor of chemical engineering, is developing implantable, temporary scaffolds that work with patients’ cells and biological signals to regenerate an organ or repair damaged tissue or bone. 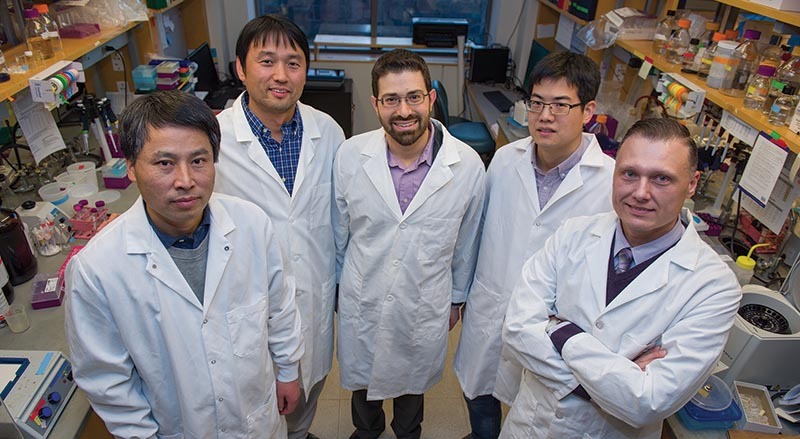 CIBBR researchers Xuanmao Chen, Kyung Jae Jeong, Jeffrey Halpern, Edward Song and Sergey Charntikov (left to right). The main challenge, Jeong explains, is creating an implantable device that won’t be rejected by the body; he and his team are working to design scaffolds that will be accepted by a patient’s immune system. Jeong’s lab will help supply a skilled workforce for federally funded biofabrication programs like the Advanced Regenerative Manufacturing Institute in Manchester. This COBRE grant caps a decade of UNH supporting interdisciplinary research and teaching in bioengineering and biomedicine and making strategic investments in instrumentation, infrastructure and faculty. Cote, who is the principal investigator for the award, will direct the CIBBR with Kelley Thomas, Hubbard Professor of Genomics and director of the Hubbard Center for Genome Studies, Don Wojchowski, UNH professor of biomedical sciences, and Steven Fiering, professor of microbiology and immunology at Dartmouth. In addition to interdisciplinary collaborations, the investigators will beneﬁt from the acquisition of new instrumentation, including a laser scanning confocal microscope and an X-ray photon spectrometer, and from a comprehensive mentoring program that will prepare them to compete successfully for their own independent research grants. The grant will also fund undergraduate and graduate researchers working in all ﬁve labs, giving UNH students hands-on access to some of the most leading-edge research on campus and important experience working under an NIH-funded project. The NIH award is the ﬁrst of three ﬁve-year grants available under the NIH COBRE program. But for now, the primary focus is the success of the research projects led by Charntikov, Halpern, Jeong, Chen and Song. Their ability to secure independent funding and “graduate” from the center, says Cote, will be the ultimate measure of the CIBBR’s achievement. As for the ﬁve junior investigators, they have eagerly begun working on their CIBBR-sponsored research projects. UNH’s new Center of Integrated Biomedical and Bioengineering Research is funded by a five-year, $10 million Center of Biomedical Research Excellence (COBRE) grant from the National Institutes of Health.